Neighbourhood Christian Communities (NCC) and Small Christian Communities (SCC). We are neighbours gathered to break the Word of God together so as to support each other in our struggles to be faithful to the gospel and to encourage one another to serve the needs of others. 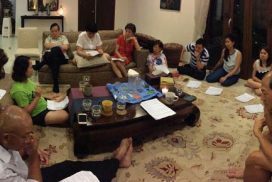 We meet regularly, at least once a month in our homes, to break the Word. We also attend relevant talks, parish-wide events, and events involving the other NCCs.